Some Cambridge residents who desire teeth whitening actually have white spots on their teeth. This condition is fairly common and caused by a variety of reasons. While teeth whitening can help eliminate the yellowing or darkening of teeth, it can also make existing white spots on your teeth more prominent. For this reason, any patient interested in the procedure will need to determine for his or her self whether or not he or she is comfortable with the potential for brighter white spots after treatment. But what causes these white spots on your teeth anyway? Read on to learn 5 common causes of white spots on your teeth. Our Cambridge doctors don’t doubt that fluoride is important for strengthening your teeth and preventing tooth decay. But, too much of a good thing can be bad. If you had too much fluoride when your teeth were developing, you may develop a condition called fluorosis. And a side effect of fluorosis is white spots on your teeth. Enamel hypoplasia is a defect of the teeth in which the enamel is hard but thin and deficient in amount, caused by defective enamel formation. There are a few things that can cause this condition. First, some nutritional problems may result in mineral result in the tooth, thus eating away at your tooth enamel. Second, taking antibiotics to reduce fever can cause enamel hypoplasia, too. But that’s not all. Enamel hypoplasia can occur in children whose mothers smoked while pregnant, or in individuals who have grooves or lines in their teeth or have tooth sensitivity. Most Cambridge dental patients already know that plaque is not something they want in their mouths. In fact, if you have too much plaque, it can result in white spots on your teeth! 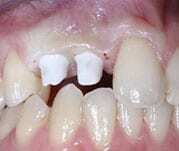 This degree of plaque accumulation may occur if you practice poor oral hygiene, especially while wearing braces. 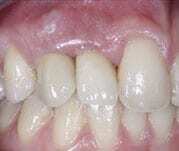 White spots on teeth resulting from inadequate oral hygiene can be carious lesions. Not only do you not want to drool on your pillow, but you also want to sleep with your mouth closed to prevent white spots from developing on your teeth, which can’t be treated with professional tooth whitening solutions. When you sleep with your mouth open, white spots develop on your teeth because of dehydration of the enamel on the teeth. But rest assured, at least in this case, there is a natural solution for the white spots. Once your teeth start receiving contact with saliva, these morning white spots typically fade away during the day. If you have any additional questions about white spots on your teeth, teeth whitening, and conditions that teeth whitening can’t fix, our doctors are here to help. To schedule a teeth whitening consultation and examination, call our Cambridge office today at (617) 492-5081. Can Dental Cleanings Prevent Cavities? How Many Shades Whiter Will My Teeth Become After Teeth Whitening?